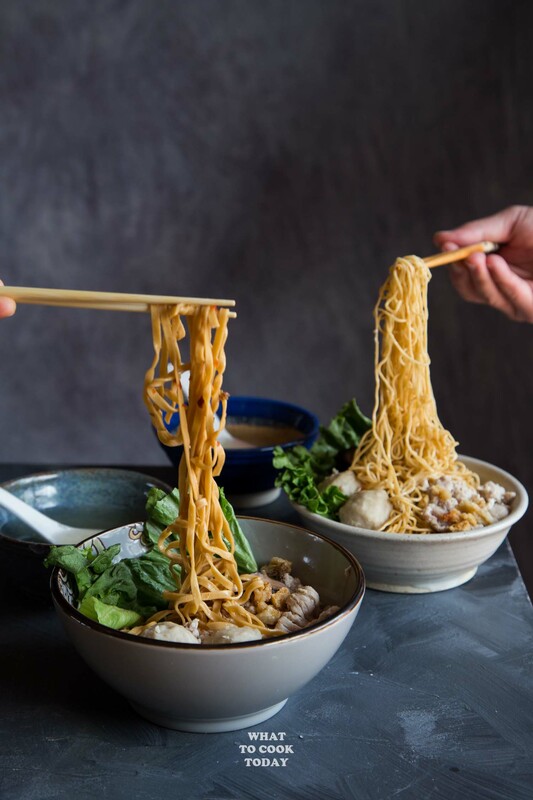 Easy Singapore Bak Chor Mee (Minced Pork Noodle) – Just imagine chewy and bouncy noodles are tossed with savory, tangy, spicy seasonings, pork lard, and topped with braised mushrooms, soft minced pork, sliced pork, meatballs, pig’s liver, and crispy lard. I simplified the recipe but they are still very tasty. 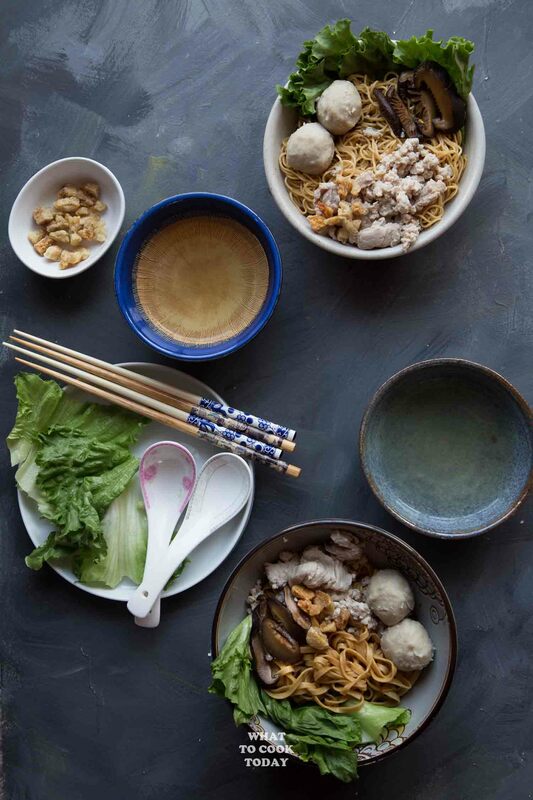 If you ask me what is one of my favorite foods to eat in Singapore, I will tell you it’s Bak Chor Mee (Minced Pork Noodles). 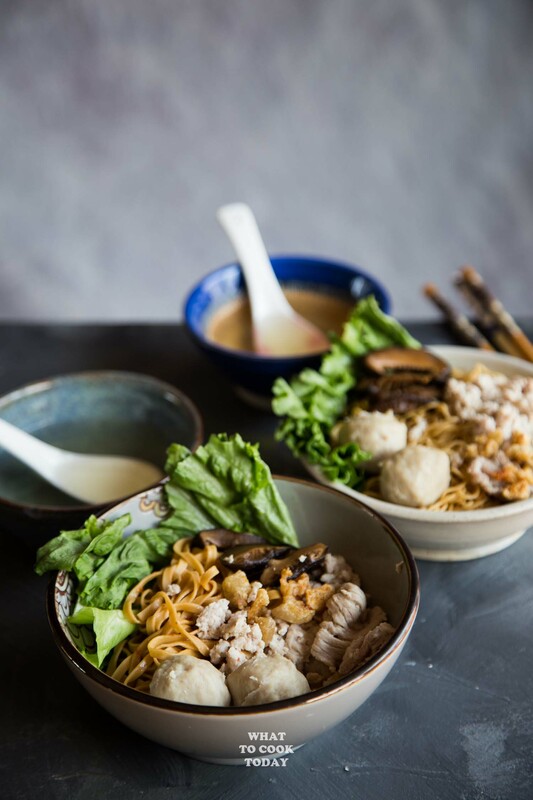 My sister introduced bak chor mee to me when I first moved to Singapore and I swear to God, I got hooked ever since to this date. 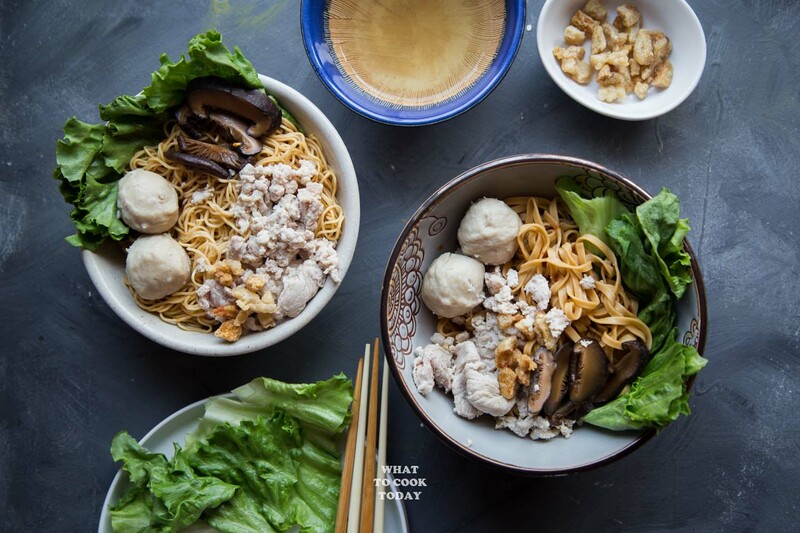 WHAT IS BAK CHOR MEE? Bak Chor means ground/minced meat. Mee means noodles. I usually eat the soupy version. 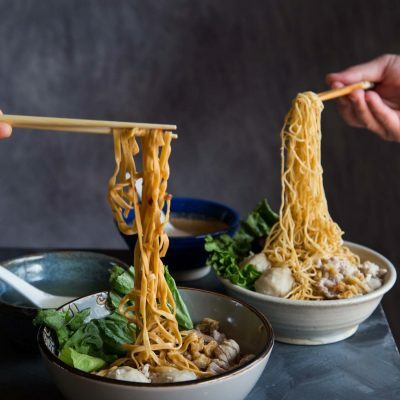 You can use thin noodles (mee kia) or wide noodles (mee pok) to make bak chor mee. I like mee pok, but if you hand me mee kia, I would inhale them within seconds too. 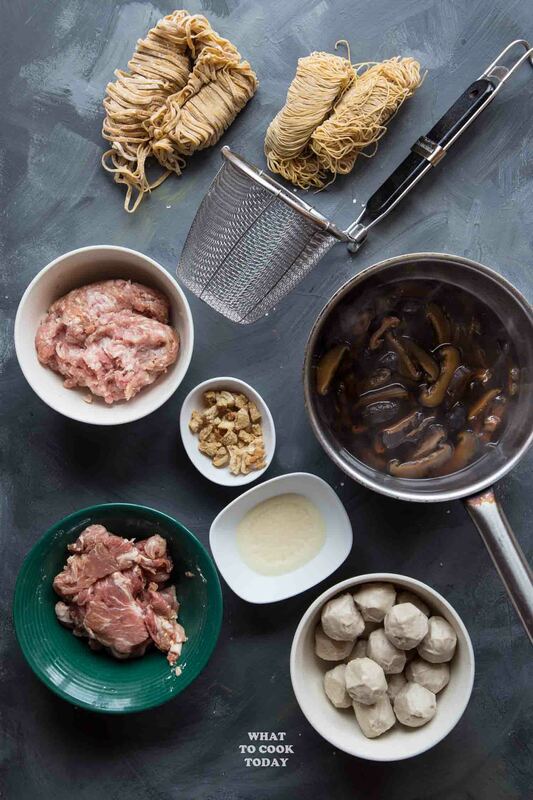 The noodles are tossed in pork lard, black vinegar, stock from braising mushroom, chili sauce (or not), a bit of fish sauce and then topped with tender slices of braised mushroom, pork meatballs, pig’s liver (not in this recipe because I couldn’t find fresh ones), minced pork, and sliced pork. I have the soup served on the side. 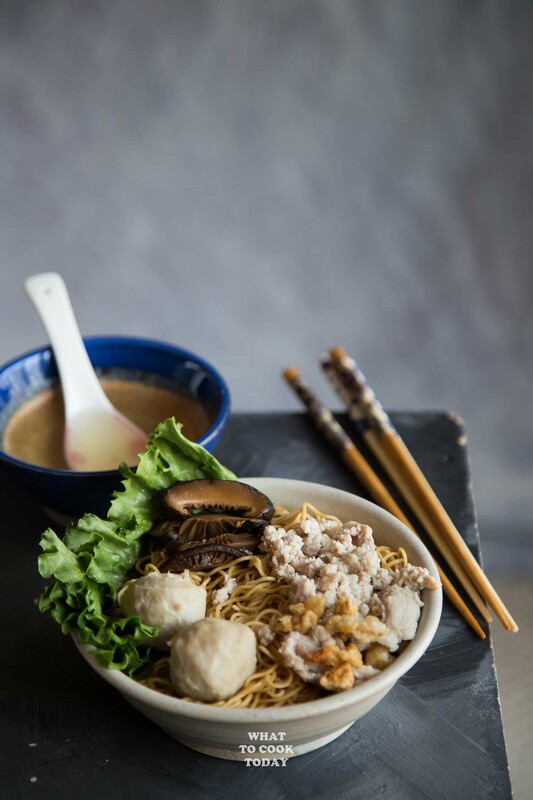 Wide and thin egg noodles, noodle mesh strainer, marinated minced/ground pork, crispy lard, braised mushrooms, marinated sliced pork, pork lard (in a solidified state), pork balls. 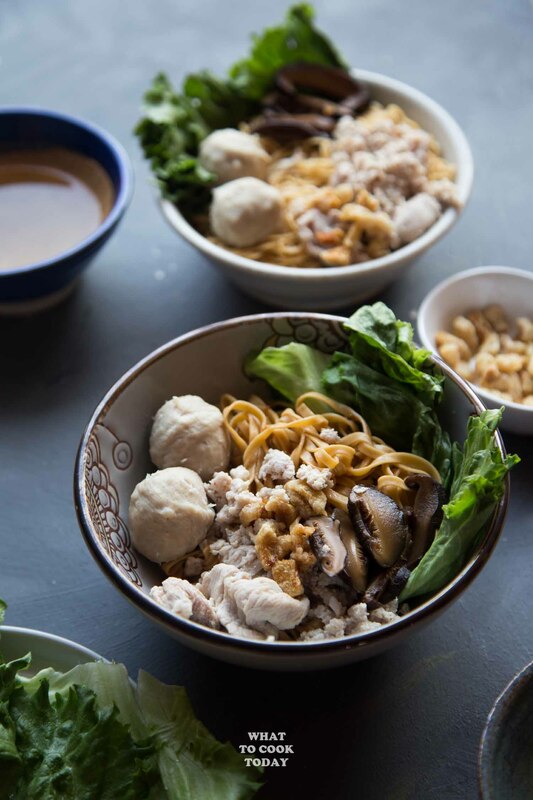 WHY IS THIS EASY BAK CHOR MEE? I call it easy version because I simplified the recipe, but trust me it is still tasty. I didn’t make the broth from scratch using pork bones. I used organic chicken broth (you don’t have to do organic) and then boil them with dried anchovies (ikan bilis). It saved so much time but still give you that nice flavor. 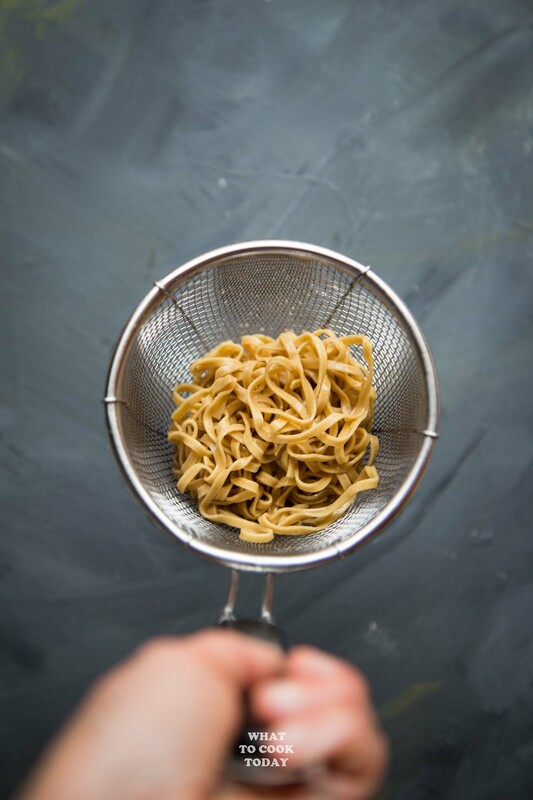 Whatever you call it, this little basket is my favorite thing to cook noodles. It cooks portion by portion and it helps to prevent overcooking the noodle too. I also use this very same tool to blanch the minced and sliced pork. Everything is contained in the basket and doesn’t make a “mess” in the broth. 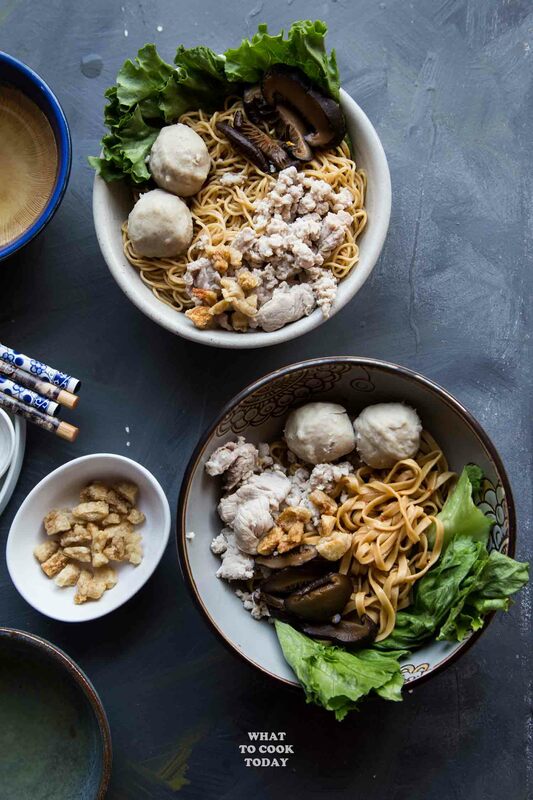 Just imagine chewy and bouncy noodles are tossed with savory, tangy, spicy seasonings, pork lard, and topped with braised mushrooms, soft minced pork, sliced pork, meatballs, pig's liver, and crispy lard. I simplified the recipe but they are still very tasty. It looks delicious! I actually managed to buy the black vinegar in England, but now I miss the dried anchovies. I remember buying them years ago, when we were living in London, and throwing them away in the end, because I didn’t know what to do with them… 🙁 I wish I had them now. Anyway could I replace them or leave them out? I’ve never made pork stock before, that would be interesting. Hi Adina, you can absolutely leave the anchovies out. It’s not necessary. When I lived in Singapore for a short while, I learned that the locals like to use dried anchovies to make stocks. 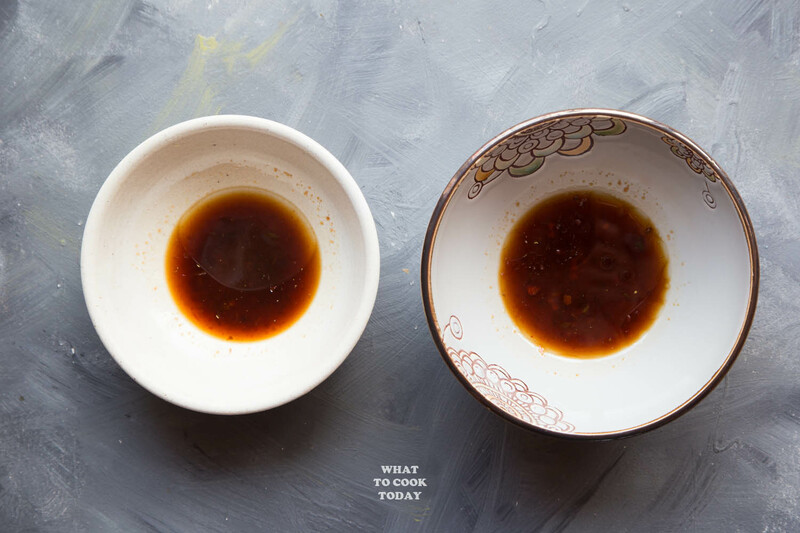 Is there any way I can replace the pork lard oil as we don’t take pork lard (health reasons)?